It is hard to find any sort of an argument with his view. On Sunday they annexed the club crown with a 12-point victory against Dr Crokes in Croke Park, 2-16 to 0-10. 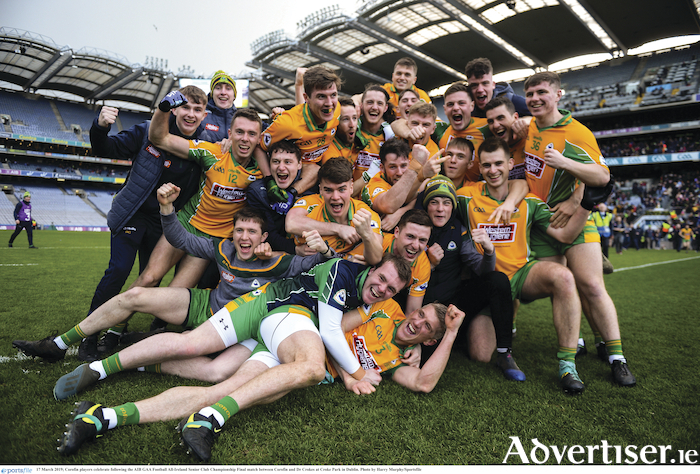 The Kerry outfit had been the last team to beat Corofin, and that was more than two years ago. However, it was not the scoreline that was the reason for Brolly's statements. It was the intricate movement, clever and precise passing, along with the capability of a huge number of the team to score from play. The Corofin players were wired for this game. The demoralising loss that Corofin had suffered to Crokes in 2017 had gone under the radar in the build-up to this game. But having suffered that 2-11 to 0-8 semi-final loss two years ago, and turning it into a 12-point win on Sunday deserves a special mention. In the dying moments of that 2017 loss, a Dr Crokes' player had fired a Corofin jersey into the stand - not something easily forgotten, and it showed in the champions’ tenacious performance on Sunday. Corofin dominated all over the pitch, but none more so than in midfield where man of the match Dathai Burke, and Ronan Steede never let the Crokes' midfield pairing of Johnny Buckley and Dathai Casey into the game. Burke was the stand-out player in a star-studded performance for Corofin. Gary Sice finished top scorer, as he has in all three All-Irleand finals he has played in for Corofin, with a personal tally of 1-5. Jason Leonard scored 1-3 and Martin Farragher contributed 0-4 all from play. Corofin’s second goal was a stunner, and reminiscent of their second goal in last year's final when lightning quick hands allowed a simple finish, this time for Gary Sice. Bernard Power was as composed as ever on the ball and three long kick passes from him led directly to scores - the pick of which was a 70 yard pass from his own 20m line to Jason Leonard on the far 65’. A straight red card to Crokes’ corner back John Payne near the end of the first half when Corofin were in control, killed the game as a contest. The Galway side went in at half-time with a 2-7 to 0-6 lead. Although Corofin were forced to replace Liam Silke at half-time due to concussion, replacement Colin Brady continued Corofin's momentum, with surging runs from the back. Corofin cruised through the entire second half and Crokes never really looked like making a comeback, only creating one goal chance which was cleared off the line by full back Kieran Fitzgerald. Fitzgerald picked up a second yellow card in the final minute of normal time, but left the field to a standing ovation. The big question now is who in Galway or the rest of the country is going to stop a push for three in a row because if they can continue to play like this it is very hard to see anyone being able to better them. Scorers: Corofin, G Sice 1-5 (0-3fs ), J Leonard 1-3, Martin Farragher 0-4, Daithi Burke 0-2, Mike Farragher, K Molloy 0-1 each. Dr Crokes : T Brosnan 0-5 (4fs ), D Casey 0-3 (2fs ), M Burns, C Cooper (f ) 0-1 each. Corofin: B Power; L Silke, K Fitzgerald, C Silke; D Wall, D McHugh, K Molloy; D Burke, R Steede; M Lundy, J Leonard, Michael Farragher; G Sice, Martin Farragher, I Burke. Subs: Colin Brady for L Silke inj (h-t ), C Cunningham for McHugh (48 ), G Burke for Lundy (53 ), C McGrath for Wall (55 ), D Canney for Sice (56 ), Ciaran Brady for D Burke (57 ). Dr Crokes: S Murphy; J Payne, M Moloney, F Fitzgerald; D O'Leary, G White, S Doolan; J Buckley, D Casey; M Burns, G O'Shea, B Looney; T Brosnan, K O'Leary, D Shaw. Subs: M Potts for Doolan (h-t ), C Cooper for O'Shea (37 ), J Kiely for K O'Leary (40 ), A O'Sullivan for D O'Leary (46 ), E Brosnan for Casey (53 ), J Lyne for Looney (57 ).